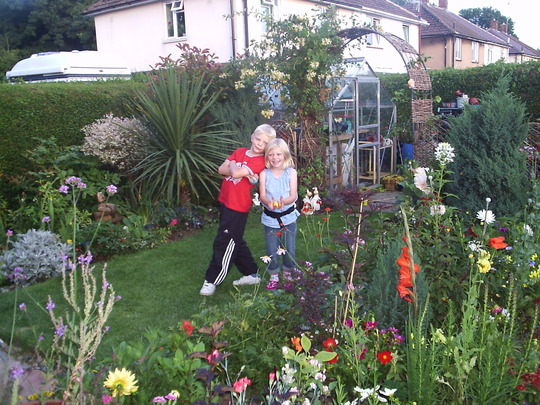 gardening with friends : James and Eilidh in Janette's lovely garden, August 2008. James and Eilidh in Janette's lovely garden, August 2008. To you, dear Janette, with love! Thank you very much, Joyous. This was taken when we met Janette and her wonderful husband and son, for real, following some communication online here on GOY! Janette's family summer garden is as amazing in real life as in her pics on her homepage (pity she and her family live 400 miles from us). Beautiful garden. This really is a picture to treasure ! Many Thanks. Glad I found it, It is the only decent pic I have of Janette's garden, as we all talked so much it grew dark before we took most of the pics, lol! Our kids know how to strike daft poses, but this one makes them look like presenters of a garden makeover show. "(Wee) Garden Invaders", perhaps? Oh, Janette, now at age 6, she'd bring any guy home, lol! She's going to cause me no end of trouble, this one, I think, lol! James just told me that, on Friday at school, the teacher asked them to nominate themselves for special roles of responsibility. He told me that he said that he wants to be the class gardener (!?!). On further questioning, I found that he asked to be allowed to water and look after the plants on the classroom windowsill and in the corridor outside! And this, from an 8-yr-old who never seems to want to do anything else at the mo but play his Star Wars games. Hmmm, I wonder, has a "seed" been sown in his mind, and will it grow? And now, I've just had an idea for the garden for a theme within a theme! ~-Well done him! a budding Alan Titchmarch? James seems to be a chip off the old block. Ah, but when it comes to growing things from seeds, Eilidh is right in there, and definitely has green fingers, I think! I'd rather James became a master builder, and build me a retirement home, haha! Yes, Spritz, I'm glad I found this one. Also found some other great, older ones, too. Precious pic David! Do your kids get a modelling fee? lol They should they are wonderful! Many Thanks, Jacque and Pollyanna. I found several brilliant older ones of them in the veggy garden (2006). May upload some later. No, would never "sell" their free souls, Pollyanna, haha! They are adorable David, you have definitely been blessed with two beautiful children...! Just think..., all those looks and brains too, watch out world ! Janette your garden looks marvelous, so full and colorful, a true gardener after my own heart...lol.